What is an Ultimate Trail Horse? 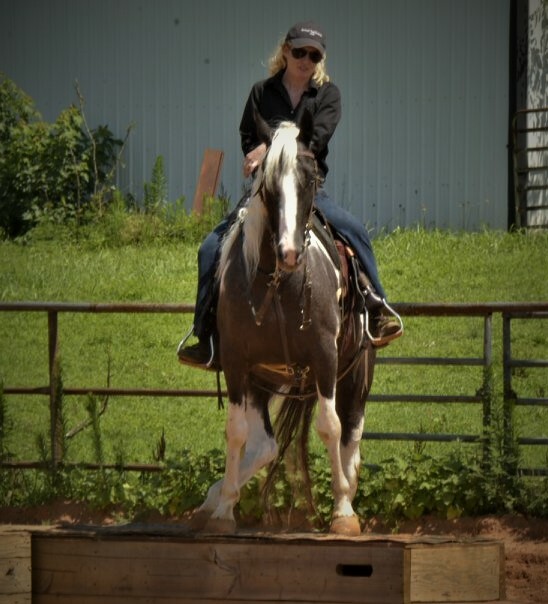 So you say you want "JUST" a trail horse? In our opinion, there is no such thing. A good trail horse has a lot more responsibility than the average show horse. He must be safe and trustworthy in a wide variety of situations. Mud, water, steep banks, no problem. Barking dogs, mailboxes, traffic, no worries. Going out for a solo ride? Right there with you. Camping in a new trailhead, you got this. 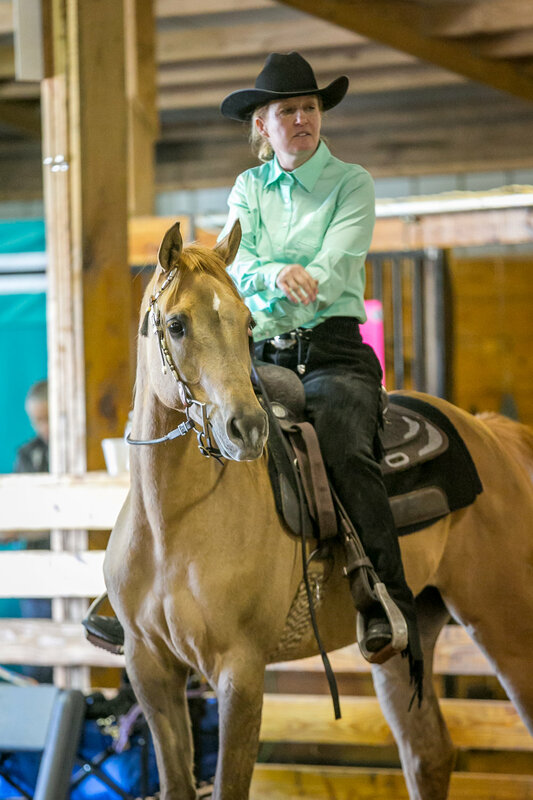 We expect a "good" trail horse to be able to handle whatever comes our way and to stay calm, willing, and comfortable. That is a tall order that can only come from experience, a great mind, and sound training. 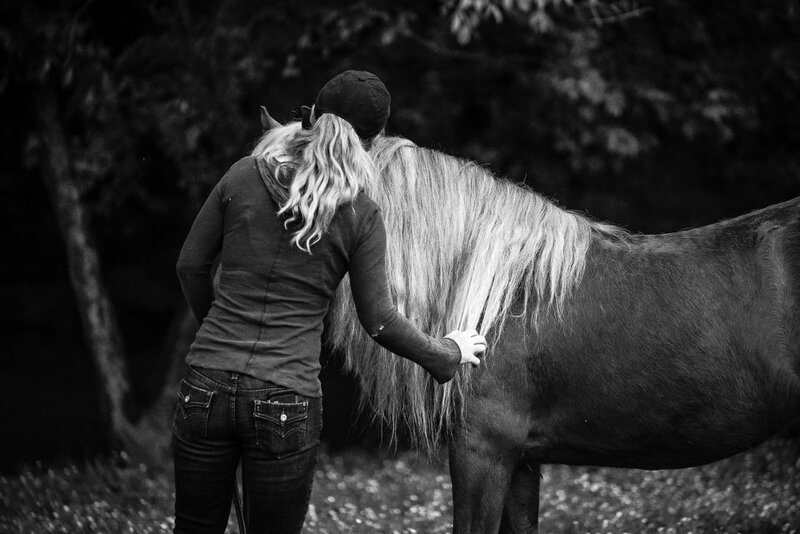 Wouldn't it be fun to ride a true partner who you can guide with a touch of the rein, miss trees with a squeeze of your leg, stop with minimal contact? In a tight spot? On a finished horse, you can just roll him back him in his tracks. 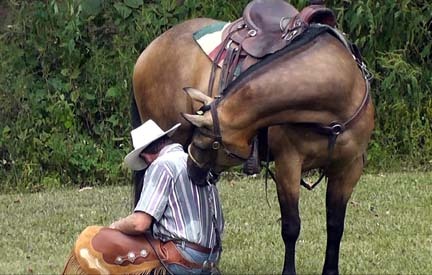 On the average trail broke horse, you have to pull his head around and take up precious room, when you may not have it. Want to set off at a nice relaxed lope across the meadow? On a finished mount, you can just give him a touch, sit back and enjoy the ride. On a less trained mount, you will need a bit more contact to maintain balance and speed control. Need to pick up a trot to catch up with your buddies? The average horse will bounce you along until he gets there. On a nicely finished mount, he will jog smoothly with a relaxed manner, without all the jarring on your back. 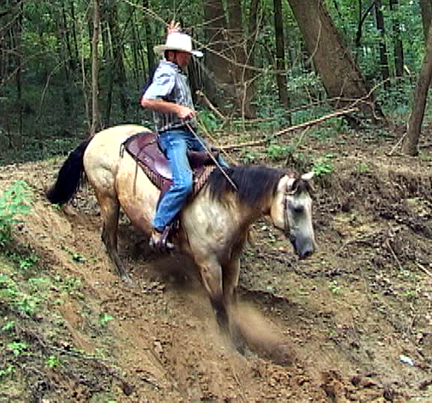 Who wants to post that extended Ranch horse trot on the trail? Need to come down a steep, slippery slope? On the average horse, he may not hold his weight back on his haunches correctly and stumble down it at the end, possibly tripping or running off balance. On a finished horse, he will sit and use his hindquarters, the safest position for you and the horse. Do you want a horse that rides in the arena with nice, rhythmic gaits, that is easy to collect and extend? One that can be forgiving of your mistakes when your seat and hands are not at their best?. Do you want one that can play on the obstacles with no drama or fuss? These are some of the things that can be added to a horse's education to enable him to become a more enjoyable and trustworthy partner, in the woods or at home in the arena. 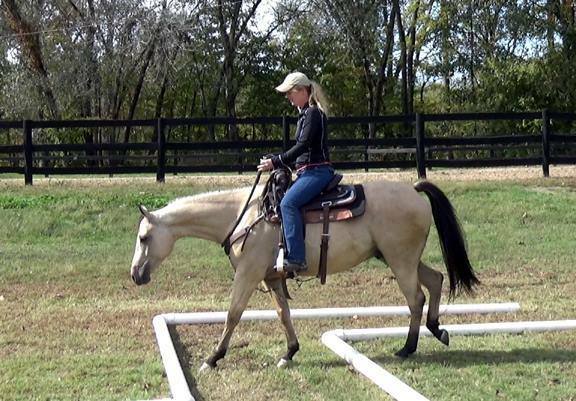 At Horse of Your Dreams, we are committed to turning out nicely trained horses that are a pleasure to ride. 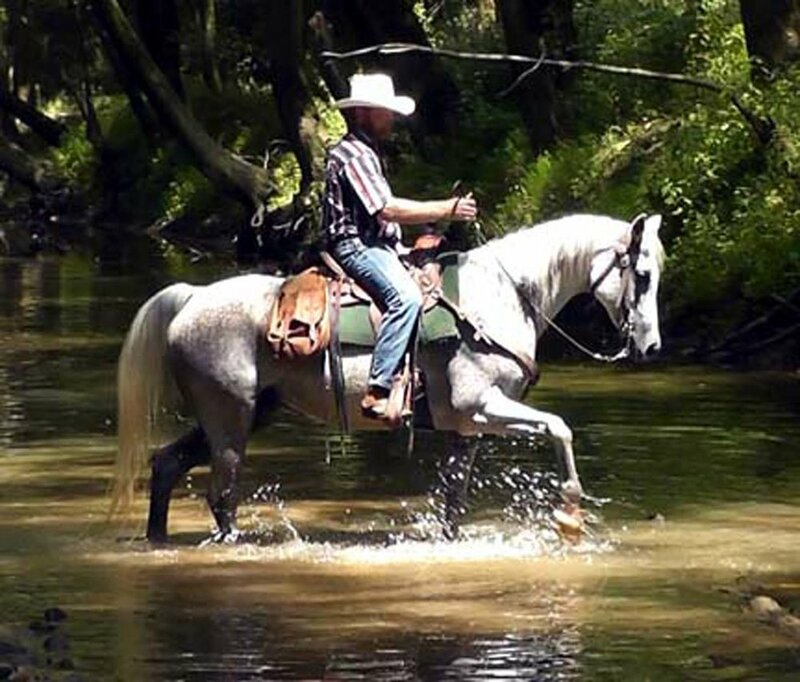 Only a select few will meet our criteria to become an Ultimate Trail Horse. It takes a large commitment of time to turn out such a nice horse, so only the best horses will make the cut. They need to be naturally quiet minded, willing to please, healthy and sound and of course, pretty to look at. I personally enjoy a horse that is curious, one that likes to be with people and one that is a quick learner. There are a lot of horses out there, but only a few possess the qualities of an Ultimate Trail Horse. We only will sell a few each season, Spring and Fall. Many of our horses are sold before they reach the website, with the training tailored to each individual buyer's needs. If you are interested in one of our finished horses contact us to see what we are working on now or have coming along soon. 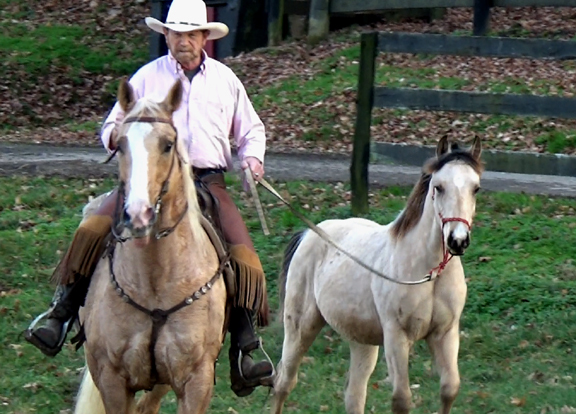 In our Ultimate Trail Horse Program, training is given in a slow, methodological manner. With this in mind, the personality and individual needs of each horse in the program is carefully analyzed and considered during the training period. Only a few will make it through our selection process. They may be good horses for other needs, but we are most careful about what type of personality that we invest our time in. 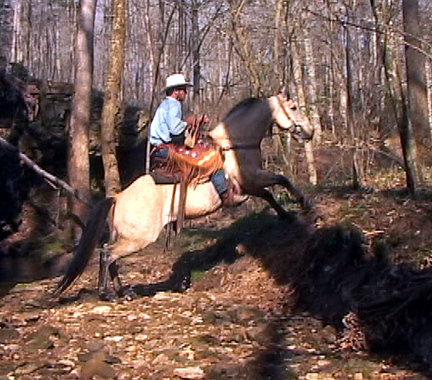 It takes a lot of specific qualities to make the cut to be Ultimate Trail Horses. 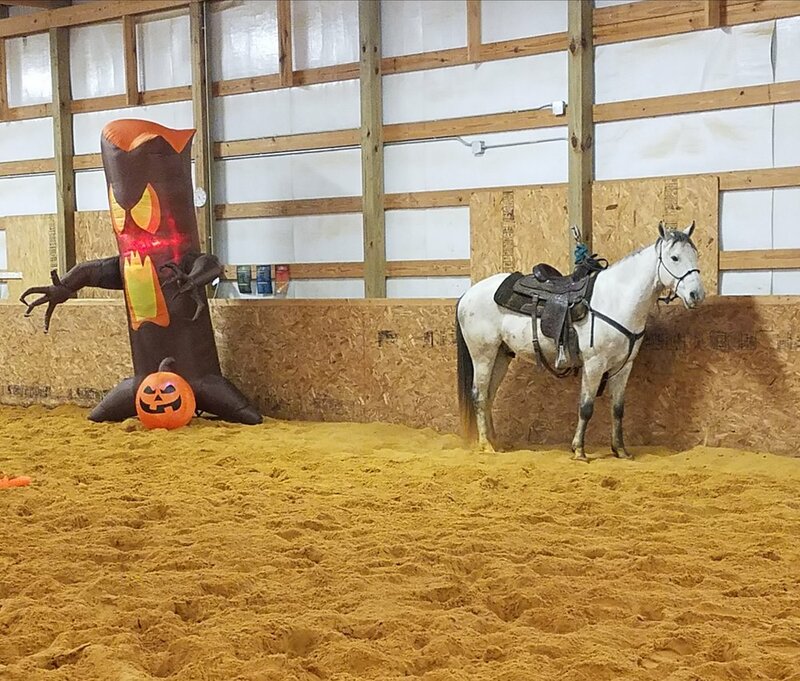 Throughout the program, the horses will graduate through the Levels, each with the goal in creating a well trained, finished horse. 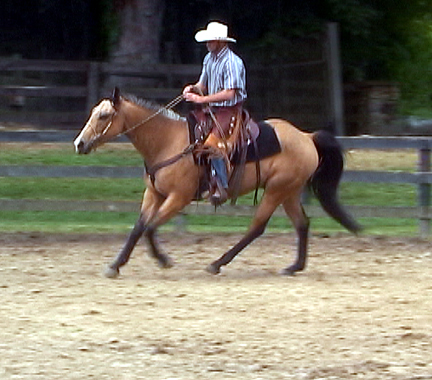 A horse will get graded on each individual aspect and must "pass" with an "A" before continuing on to the next Level. So what are the levels? Level One is the basic broke horse. He will walk, trot and canter when asked. He will back up under saddle. 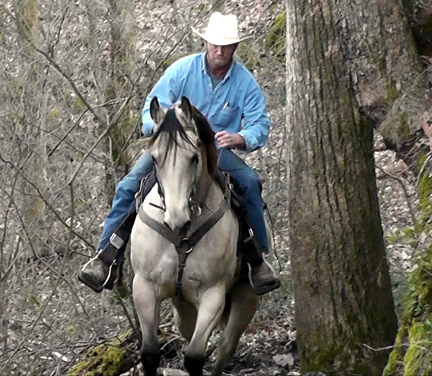 He has been on enough trail rides to be comfortable in the woods in normal riding situations. 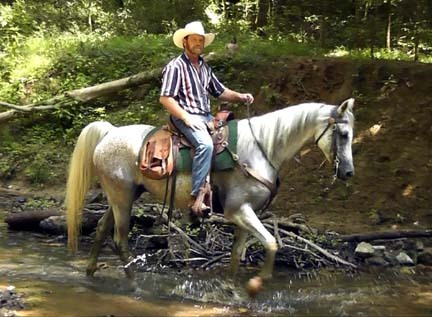 This is the easiest horse to find available, and many trail horses are never finished beyond this level. Level Two is the next step up. Here we start putting some finesse and solid structure on the horse from the ground and in the saddle. He will lead properly from the shoulder and will back when you back with a cue. He will drop his head to be haltered. He stands for bathing and clipping on a single rope or crossties. He is comfortable with the farrier and veterinarian. 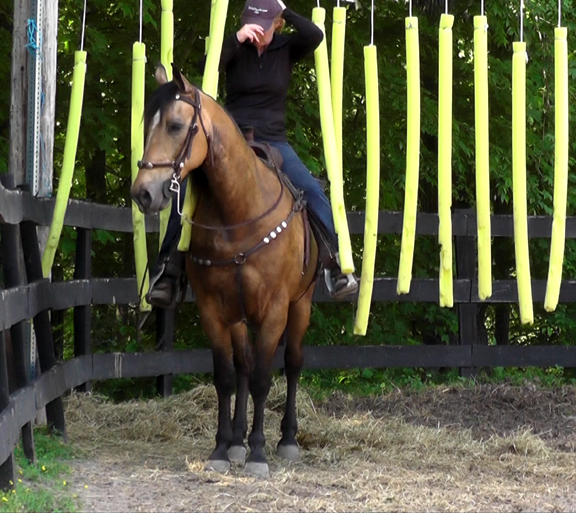 He will stand still for mounting and knows lateral flexion. The horse will walk, trot and canter in a circle on cue. He will back up under saddle with light pressure. He is beginning to develop some cadence and rhythm in his gaits and overall confidence in his work. He has covered more miles on the trail and is very comfortable in most situations, alone or in a group. He will be versed in the Clinton Anderson Fundamentals, which will give him a solid foundation to progress in any endeavor. The Program consists of a lot of ground and riding exercises and produces a good thinking, well mannered partner. Level Three is where we begin to get a better finish on the horse. He will drop his head to bridle and stand perfectly still for mounting. He is easy to cue and responsive to your aids. 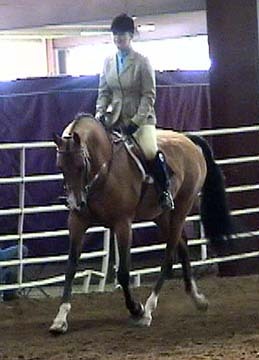 He will have nice, soft and rhythmic gaits and not need much rating from his rider. He will do a balanced circle on the correct lead when asked. He will yield to the leg and will sidepass and turn on the haunches or forehand. He is nice and soft in the bridle and will collect to bit pressure. He has had miles on tough trails. He is very comfortable in any likely trail situation. 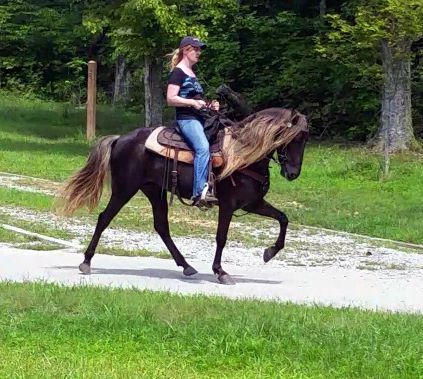 He has been to group trail ride events and behaved well. He will picket and tie to the trailer overnight. He has been exposed to wagons and to motor traffic. Tired of hitting your knees on trees? A level three horse will push away from the tree with a press of your calf. He has also been immersed in our obstacle course training. He is proficient over the wooden bridge, wobble board, cowboy curtain, desensitized to a tarp and more. He will open and close a gate with ease. This horse is pretty darn good and soon will progress to the finish of a Level 4 Ultimate Trail Horse. Level Four is the Ultimate Finishing. Here we fine tune everything to a sharp point. The horse will have an excellent handle on him with just a light touch. His neckrein is easy and light. He will do a nice, correct spin, sidepass, and rollback. He will turn on the haunches or the forehand. Leg yield, shoulder in and out, soft and supple in all four quadrants. He will have a great rate and will ride in all gaits on a loose rein. He will whoa with just your seat and guide with the smoothest command. You can ride him with just a rope around his neck, if desired. He will be relaxed and confident in his manner and will tolerate mistakes from his rider and handler. He will drop his head to bridle and halter. You can saddle him with no restraint, ground tied when needed. He stands still from mounting on either side. He will be versed in the Clinton Anderson Advanced exercises and much more. This horse will go over any obstacle, man-made or natural. Bridges, tarps, creeks or rock ledges. You can drag logs forward or backward. He will jump anything if desired. He will load into a trailer by himself and will back out easily. He will stand tied to a trailer, or in crossties. He will clip, bathe and has excellent ground manners. Overall, the Level Four horse is finished in his gaits and handle like a show horse but has the training and sensibility of a trail horse. The Ultimate Best of Both Worlds. 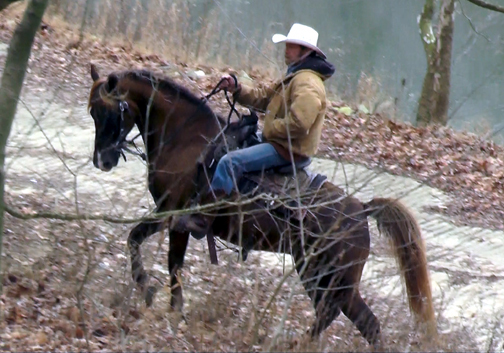 Below is a video highlighting some of the horses that have been through our training program. Many more photos are linked at the bottom of the page. I also keep an updated video gallery that will show some of our current trainees in action, some of our past graduates, and a few training tips as well. Click here to access that video page.